Order 1 - only $9.95. 100% Satisfaction Guarantee: If you are not completely satisfied with any item you purchase from Sweet Company, return it to us for an exchange or refund of its purchase price. The form you receive in your package will act as a "pre-authorized" return form. You may also download a return form from the Easy Returns section found at the footer of each web page. Just fill it out and return the product for an exchange or refund. We even pay the shipping costs to return the exchange merchandise back to you. 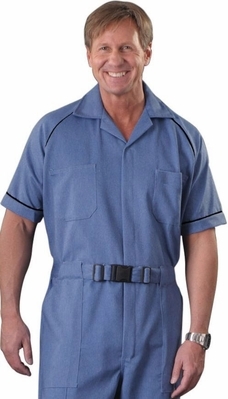 Determining Your Jumpsuit Size is easier than you may think! 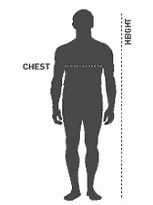 In most cases, only two measurements are needed: CHEST and HEIGHT. You can then use these two measurements in the chart below to find the size that will most likely be your ideal fit. Chest: With arms at your sides, measure around your upper body under your armpits and over the fullest part of your chest and shoulder blades, keeping tape parallel to the floor. Round UP to the nearest inch. Height: You will use your overall height to determine if your length is Short, Regular, Long, or X-Tall. TIP #1: If Waist is Larger than chest, you may need to go up one Chest Size. TIP #2: The Lengths - Short, Regular, Long, X-Tall - differ not just in the leg length, but also in the body (or torso) length. So if your torso/body is unusually long for your height, you may want to consider the next longer Length category. This is especially true if you are at the upper end of one of these height categories.